Beautyqueenuk | A UK Beauty and Lifestyle Blog: Lookfantastic x bareMinerals Limited Edition Beauty Box Out Now! 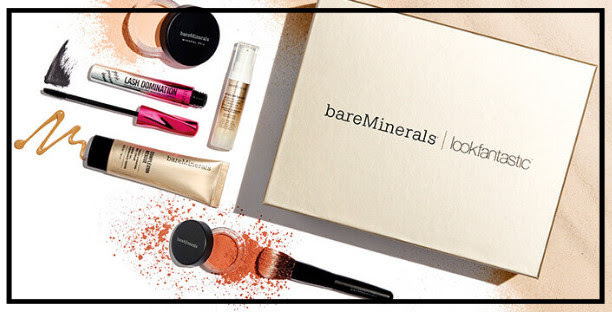 Lookfantastic x bareMinerals Limited Edition Beauty Box Out Now! There is a new beauty box in town from Lookfantastic and this time it is a bareMinerals Limited Edition Beauty Box. The box contains a variety of favourites from the brand, including three full-size products! I am new to bareMinerals as a brand and have only recently used the Complexion Rescue which I reviewed here. I really like the idea of a one off Limited Edition Box, something I think Beauty Boxes do really well. The box has a total worth value of over £62 but you can get yours now for just £35! Plus, existing lookfantastic Beauty Box subscribers get an extra £5 discount, which will be sent via email with an exclusive discount code! With an extremely limited number of boxes available, make sure you don’t miss out on this box! Will you be grabbing this box? I can't believe it contains so many full sized products! Such a amazing value for money. I'm a huge fan of their Mineral Veil powder and mascara. Sounds like a good selection box. I particularly like the sound of the All Over Face Colour in Soft Romance. I used to use Bare Minerals and loved it. I must try it again. Great box! This is such a good box for the price! I wish I could get this in NZ! Oh wow this sounds amazing! Love bare minerals! This is such a bargain and would be great for someone to get an introduction to the brand!